Jake Sully is a marine that is sent to the mysterious planet Pandora to participate in the "Avatar" program. The program consists of taking control of an alien form known as the Na'vi and infiltrating their tribe to help the military find a supply of a rare element known as "Unobtanium"
James Cameron is known for being at the forefront of technology in filmmaking and in the process has created (and taken over) some of the most memorable franchises in movie history. Avatar is Cameron's first movie since 1995 and man is it mediocre. Nothing in this film is any different from anything else he has made and the movie really suffers for it. You know how the last Harry Potter book felt like J.K. Rowling was just running through a checklist of things the audience expected from her? That's exactly what Cameron does here. Space marines. Check. Aliens. Check. New technology. Check. Hard nosed colonel that has a scar, gray hair and talks in a gravelly voice. Check. Mechs. Check. Jerkface corporate guy that will screw over everyone because all he cares about is money. Check. Sigourney Weaver. Check. Obnoxiously long. Check. Yeah, it's all here. And it's all subpar. Weaver is good as always, but she comes off as Ripley with a PhD. Sam Worthington is a very likable actor and he really kept me involved in his character so he scores there. My biggest complaint about a performance though is definitely from Giovanni Ribisi. The guy even LOOKS like Paul Reiser in Aliens! The plot here is tried and true. Evil corporation tries to take land from "savage" people. One of the men working for the corporation becomes part of the tribe and is treated like one of their own, thus leading to an inspirational speech and an uprising against said corporation. And that's the problem, Avatar takes the characters in Aliens, the plot from Dances with Wolves and the monologues from Braveheart, thrown them in a blender and sent them off to post-production to get all gussied up so we wouldn't notice. All those claims about Avatar changing the way you think about cinema forever are not true as I've seen this movie before. Just, split up and divided amongst 3 other films. Which brings me to this. Avatar LOOKS amazing. Everything you've heard about the look of this film is absolutely true. The CGI is the best we've seen since Gollum and is photo-realistic most of the time. If you're planning on seeing this film see it in 3-D. Do yourself a favor and drop the extra $3.50. I don't care if you think it's a gimmick, this film will change your mind. The stuff Cameron does with the perspective in 3-D is simply incredible. However this leads to another Cameron downfall. He has always been a "because we can" type of filmmaker. This means Avatar is about an hour longer than it should be with nothing but filler shots of neon bugs and the ground lighting up like the entire planet is made out of the Billie Jean video. Does it look great? Absolutely. Is it necessary? Not really. This film will go on to win a bunch of awards for visual effects and sound editing and it deserves every single one of them. 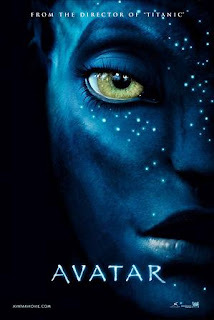 Though, visually arresting as this film may be, without all the bells and whistles Avatar would have been one of the worst movies of the year. Since when do movies require totally unique and original plots to just be considered good? Look at The Departed. It was an adaptation of an Asian movie released not that long ago and it is considered to be one of Scorsese's best movies he ever made. Cameron never really writes wholly original scripts. They're almost always based heavily on previous sources. But he always finds ways to present fresh takes on old formulas that make them interesting. Sure, the plot is so close to Last of the Mohicans that it's scary, but that doesn't hamper the feelings I have for both individually. And the 3D tech blew my mind. It absolutely delivered on the promises that Cameron made about it years and years ago. And not only that, but the CG was quite possibly the best we've seen to date. So essentially, I thought Avatar was a bonafide masterpiece.